Merging clusters in 30 Doradus (non-annotated). Image released August 16, 2012. A new photo from NASA's Hubble Space Telescope shows two star clusters that appear to be in the early stages of merging. The colliding clusters are 170,000 light-years away in the Large Magellanic Cloud, a small satellite galaxy of our own Milky Way. They're found in the core of a massive star-forming region called 30 Doradus, which is also known as the Tarantula Nebula. Scientists originally thought the clump of stars was a single cluster, but the new Hubble images suggest there are two distinct groups that differ in age by about 1 million years, scientists said. "Stars are supposed to form in clusters, but there are many young stars outside 30 Doradus that could not have formed where they are; they may have been ejected at very high velocity from 30 Doradus itself," Sabbi said in statement. The giant gas clouds that condense to form star clusters can fragment into smaller pieces, according to some models. Once these smaller bits begin producing stars, they might then merge to become a bigger system. Sabbi and her team think this may be happening in 30 Doradus. While perusing the Hubble data, the team noticed something odd about the supposed single cluster at the heart of 30 Doradus. Rather than being spherical as expected, it's elongated in places — just like merging galaxies that get stretched by each other's gravitational pull. There are also lots of high-speed runaway stars around 30 Doradus, researchers said. They may have been ejected after a process called core collapse, in which huge stars sink to the center of a cluster. This makes the core unstable, and the big stars begin booting each other out into space. This is a Hubble Space Telescope image of a pair of star clusters that are believed to be in the early stages of colliding. The clusters lie in the gigantic 30 Doradus Nebula, which is 170,000 light-years from Earth. Image released August 16, 2012. 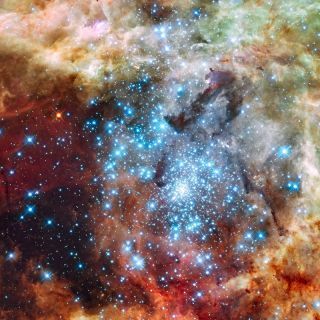 The big cluster in the center of 30 Doradus, known as R136, is too young to have experienced a core collapse, researchers said. But the phenomenon can occur more quickly in small systems, so the runaway stars may have been produced after a smaller cluster merged into R136. The researchers hope to tease out more of the details via follow-up observations with Hubble and other telescopes. Further study of 30 Doradus could help scientists understand the details of cluster formation and how stars formed in the early universe, researchers said.